﻿I've lived in Cleveland for my entire life and I've only recently started to explore Shaker Heights. Growing up in the wild, wild east (hello, un-awesome Lake County), Shaker Heights was a place I don't even think I'd heard of. So even though I live relatively close to Shaker, I just never think to go there. Until recently. I've been hitting up the market on Saturdays for all sorts of fresh veggies (at least until my Fresh Fork Market CSA subscription starts) and have started to notice that there are a bunch of places I need to try out. My boyfriend was a little hesitant to go to with me to Grotto this past weekend. Until I explained that this wine bar/restaurant is owned by the same people who own the uber friendly Lago in Tremont. We both love Lago (and are VERY interested to see what happens when they move to the Flats) so I figured we'd probably like Grotto, too. And I think we actually both remarked that we might even like Grotto better after the meal we had there. Despite being a wine bar, Grotto has a pretty limited wine menu. Interesting, but I'm no wine snob. I had a couple $8 glasses of an unremarkable Riesling, but I was happy. My boyfriend attempted to order a Moscow mule but their full bar didn't have ginger beer. Oh well. He had beer instead. We were brought some fresh bread to nosh on while we waited to order. Our poor server seemed a bit overwhelmed. We stopped in on a Friday night, and the place seemed to be hopping with people. Servers? Not so much. I ordered a salad to start and my boyfriend ordered an order of pommes frites. Our waiter scored immediate points with me by being able to tell me that the fries were fried in canola oil and not something like duck fat without even having to ask. I ordered the vegetarian lasagna as my entree and my boyfriend ordered lobster gnocchi because the lobster gnocchi at Lago is one of his favorite things ever. Our fries and salad arrived quickly. It's hard to mess up a salad, so I was pleased. And the fries were garlicky and delicious. We saw our server running around, and although he didn't have time to check on us, it seems like everyone on the wait staff was pitching in to check on various tables. It was a nice touch. 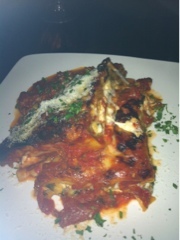 The vegetarian lasagna is better than my picture taking abilities. I was almost overwhelmed when my vegetarian lasagna arrived. There were two huge hunks of lasagna. The kind you'd get served up at a family party - not a nice restaurant. My boyfriend also got a heaping bowl of gnocchi. This was in stark contrast to the meals we've enjoyed at Lago. I honestly never leave there feeling full. But this meal at Grotto was a feast! My lasagna was excellent (and awesome, because how often do you find vegetarian lasagna on a menu) and my boyfriend said his gnocchi was even better than what he's had at Lago so we were both pretty pleased. And full. I'm not the kind of person to not clean her plate (don't challenge me to an eating contest), but I couldn't finish my food. Sorry Lago, but I think you've just lost two super fans. I think we'll be hitting up Grotto much more often.